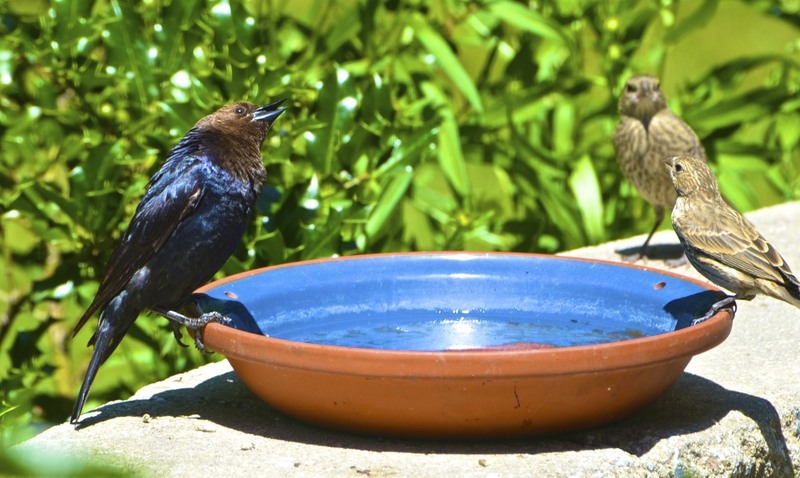 Cowbird Carl: Are you two gossiping again about that squirrel? Fannie Finch: It's not gossip! The rumor in the yard is that crazy squirrel is going to make a leap for it. Cowbird Carl: Whad-a-ya mean "make a leap for it?" 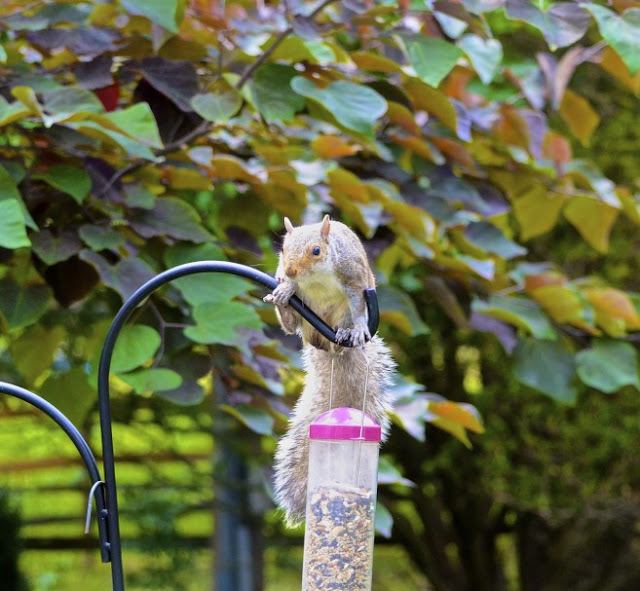 I thought he gave up trying to break into those bird feeders. This is all just idle gossip. Fannie Finch: Well, I don't think so. I heard it from Fred Finch. Fred Finch: That's right Cowbird Carl. I told Fannie. 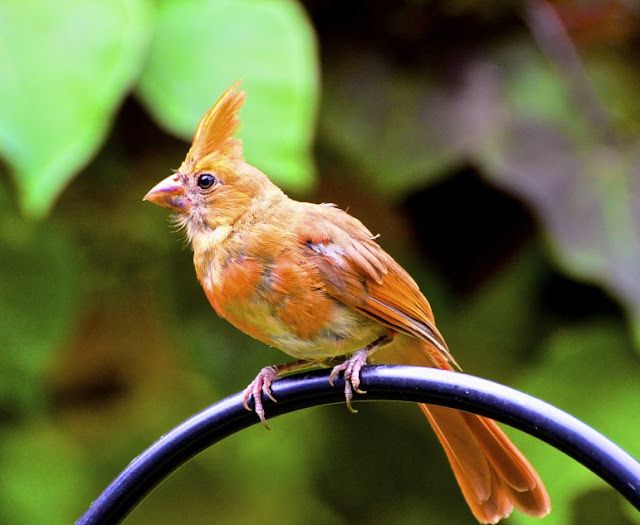 I heard it from Pope Cardinal Jr.
Cowbird Carl: Oh yeh, that new youngin' that's been hanging around causing a bunch of trouble? Pope Cardinal Jr.: Hey, I heard that remark! Cowbird Carl: Well, if the beak fits, wear it. You been out carousing around with a rowdy bunch. Makin' all kinds of trouble and now stirring everybody up with rumors. Pope Cardinal Jr.: They're not rumors. 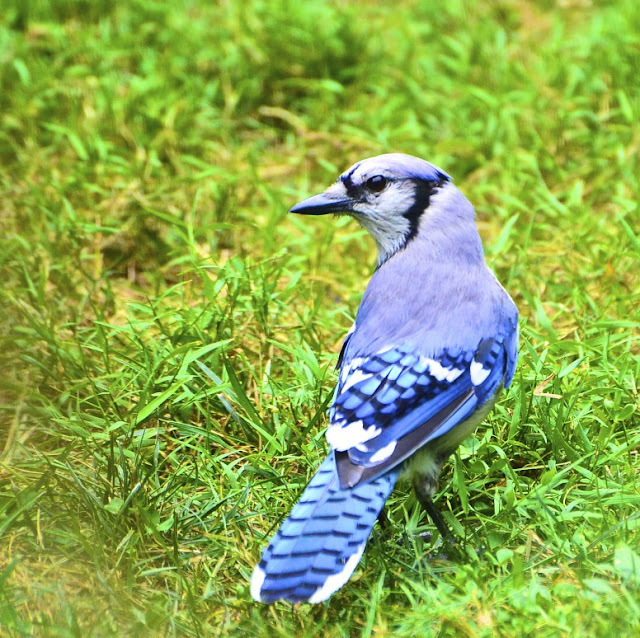 I heard it from Blue Jay Bobbie. He knows everything! Blue Jay Bobbie: Well thank ya, Jr. Mighty kind of you to think of me that way. 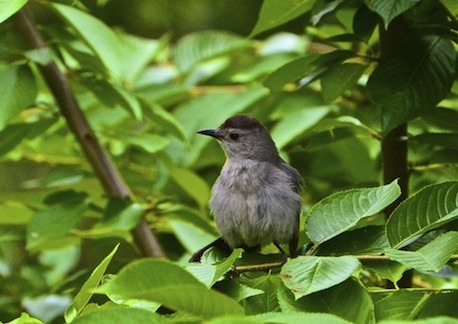 Yes, I did hear it from a little birdie ... that young little cute Catbird Cate. Catbird Cate: (blushing Cate) Oh, yes, yes I told him! I thought someone should know the trouble that squirrel is going to cause! Darth Vader Squirrel: Hey, it's not me that's gonna make the leap. So don't be lookin' my way! 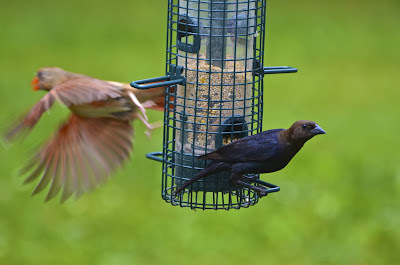 Theo Thumper: Cowbird Carl, how come you are just hearing about this. They've been talking about this for days. I happened to overhear Rocky Squirrel telling one of his little buddies about making the leap while I was over here eatin' on this hibiscus. Which, by the way, is so tasty! 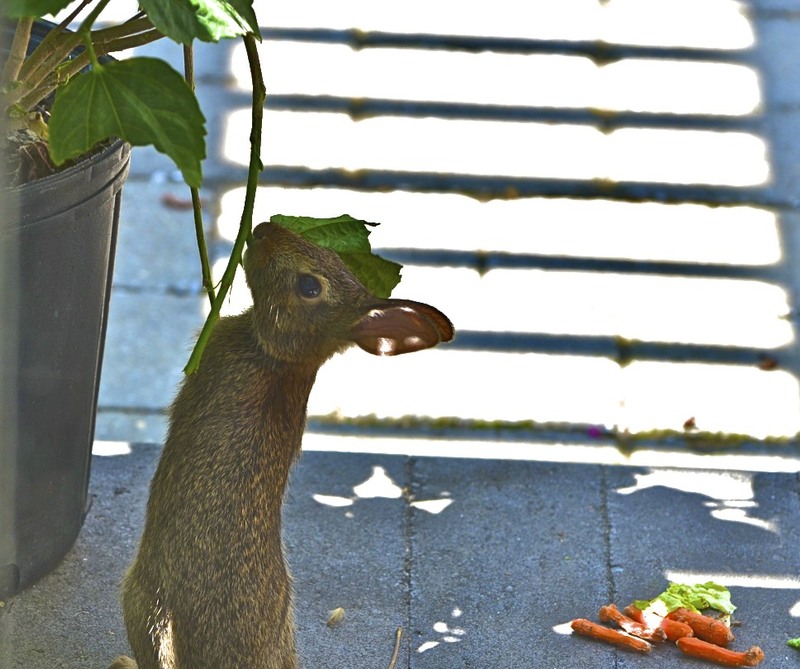 Theo Thumper: I don't know why that House Lady keeps putting out these carrots. They're awful! But this hibiscus plant ... well, it is just about the best food out here! Darth Vader Squirrel: No way Rabbit! These corn cobs are are sw-ee-ee--eat! I don't know why Rocky is always having to climb those poles when there is perfectly good food down here. Cowbird Carl: (shouting) Will someone, please tell me who is saying Squirrel is going to make a leap for it!!! All he's going to do is upset the House Lady and then none of us is going to get any food! Pope Cardinal Jr.: Hey man, no need to yell. It was Carmen Chipmunk. She knows all about it. He's been sweet on her for some time now. 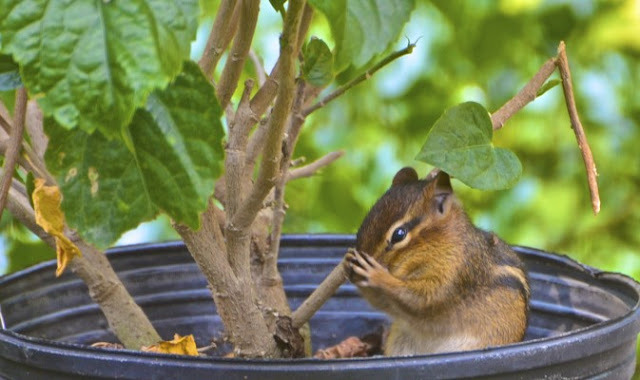 Carmen Chipmunk: (embarrassed) That's not so, Jr.! We're just good friends! Isn't that right Rocky? Rocky Squirrel: That's right Carmen, girl. Don't let him get to ya. Carmen Chipmunk: Are you really going to try to make the leap today, Rocky! Rocky Squirrel: Oh yeh! I've been having nightmares about getting up that pole over there with that wiggly thing. I finally figured the only way was to attack it from the top and make the huge leap! 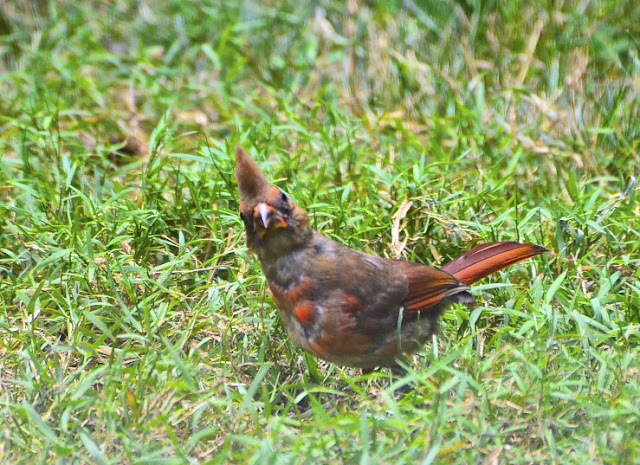 Cowbird Carl: Squirrel, what's wrong with your head? You're not a bird. This is BIRD food, not SQUIRREL food! Look over there at your friend Darth Vader. He's happy as a lark with that corn cob. That's YOUR type of food. Rocky Squirrel: Mind your own business bird! I LIKE your food ... you have nuts and berries. 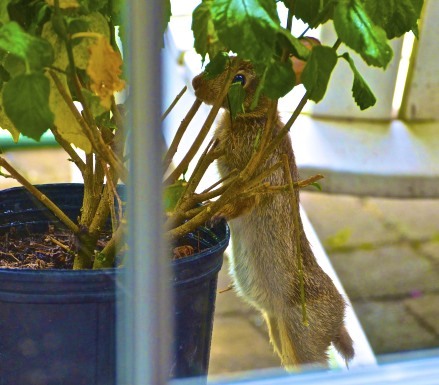 Squirrels like nuts and berries just as much as you do! Now quit bothering me... I gotta concentrate ... I got me some flying to do! Carmen Chipmunk: Oh Rocky, please be careful! I don't think the House Lady likes it when you climb that pole. 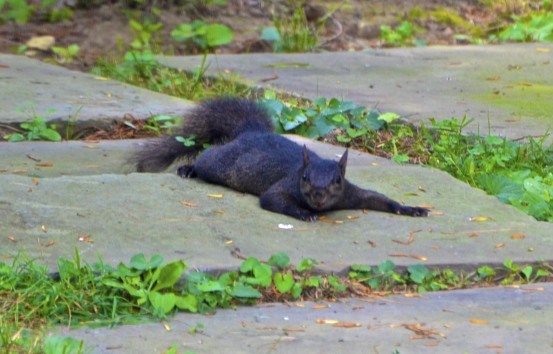 Rocky Squirrel: No worries .... I can do this!!!! I've been practicing. Rocky Squirrel: Ta - da!!! Piece of cake or better yet, nuts. Now, I better hurry up and eat some before that House Lady gets out here. 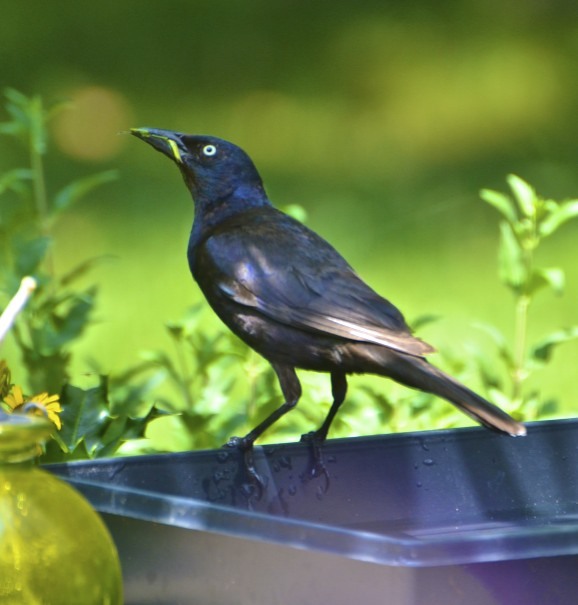 Cary Grackle: Well I'll be ... Crazy Squirrel ... he made it! Pope Cardinal Jr.: Uh ... not for long ... here comes the House Lady! Darth Vader Squirrel: I'm outta here and I'm NOT sharing, Rocky! Comments from the House Lady: Upon observing that flying leap ... after I moved the poles away from each other twice already .... I made another journey outside and anchored the pole even further away. 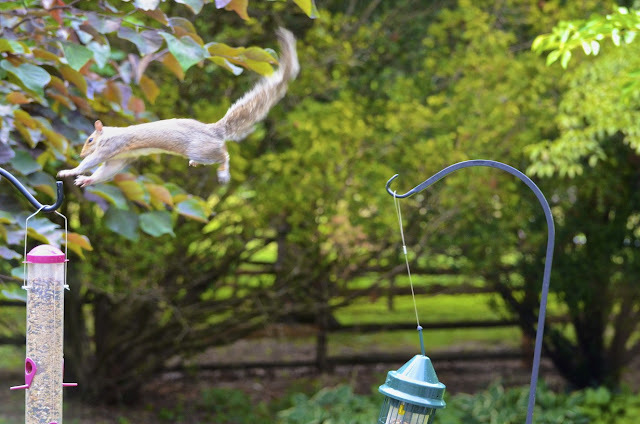 So far, Rocky Squirrel has not made the leap again! PS. But I imagine it is only a matter of time! LOL!!! Oh my goodness! what a great cast of characters! I'm sweet on catbird cate and carmen chipmunk and darth vadar squirrel! 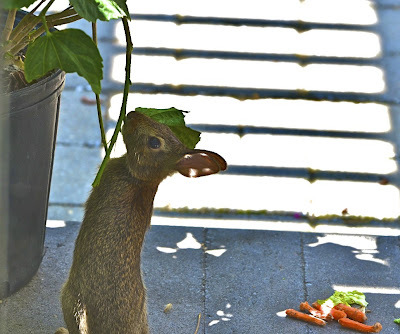 oh yes, theo thumper too who won't eat your carrots! ha ha! great action shot of rocky!!! This is so very funny. You just crack me up. The pictures are fantastic but your commentary just makes it all come so alive! 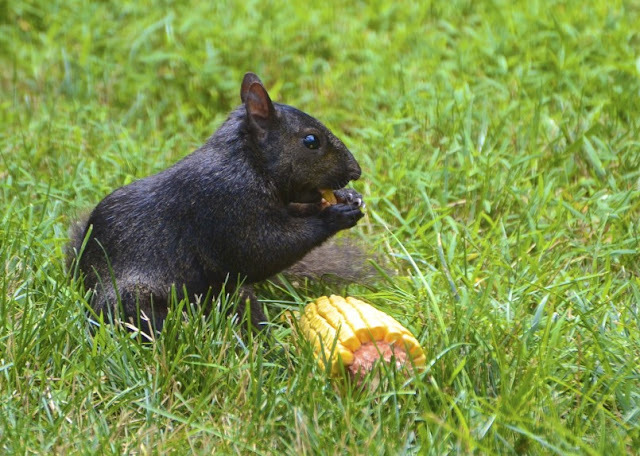 I miss seeing black squirrels. Always had them around the yard when we lived in Maryland... just boring brownish ones here in Virginia. Cute story for all your characters! Oh my gosh, this is wonderful! What a yard full of characters you have! I love Cary Grackle :) And of course, Darth Vader Squirrel! Oh, I do love your sense of humor, Reena, and your yard full of critters! Definitely a great cast and you write a terrific script! The modesty patch almost caused me to spew my wine all over my screen!! 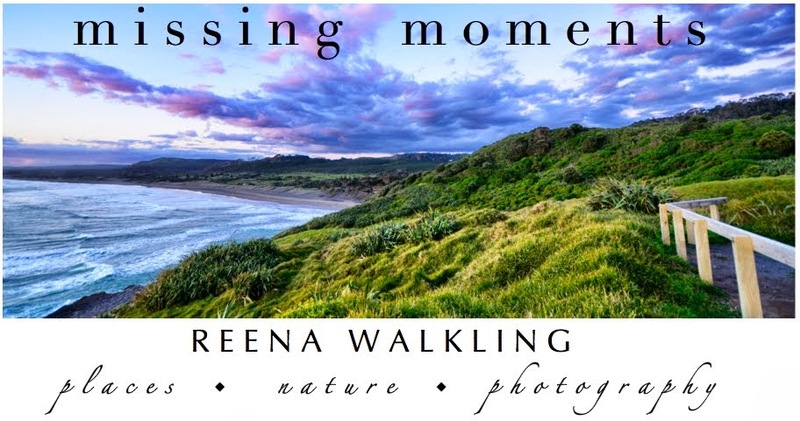 Such a fun delightful post and a wonderful way to wind down my day! Enjoy your evening and have a wonderful tomorrow! Oh ya..i've been admiring your bird feeder.We dont have here in my country....so sad. i wonder if you did anything else today?? i get so caught up in the going-ons in my yard!!! what a great way to enjoy your day!!! chipmunk ... I want one !! as darth vadar squirrel's prize!!! Oh my goodness, what a great story and your characters are hilarious! Great shots of everyone especially the squirrels. I love that leap. I would have to keep the poles up just to watch the flying leaps. I really needed a lift this morning, and this has been it! But I have to admit that these types of conversations are contagious--I found myself doing it yesterday at work when a bird landed on our window sill! Great catch of the leap. Clever buggers! We finally succumbed to buying bird food again (I was jealous that all the birds were eating at the restaurant next door) and of course who do we see feasting the most? Yup, you got it! (Photo coming this weekend). So, yesterday hubby lathered some vaseline onto the poles and so far, so good!! You crack me up with your story telling, thanks for the giggle this morning . . . it was just what I needed. The number of intelligent critters in your yard is simply amazing -- I can just imagine all the chit chat and gossip that goes on (I just think they stop gossiping about you when you're within earshot). The whole post just made me happy. You and I thiking birdbaths today. That's hysterical! It's amazing you caught all that action...brava! Hysterical. 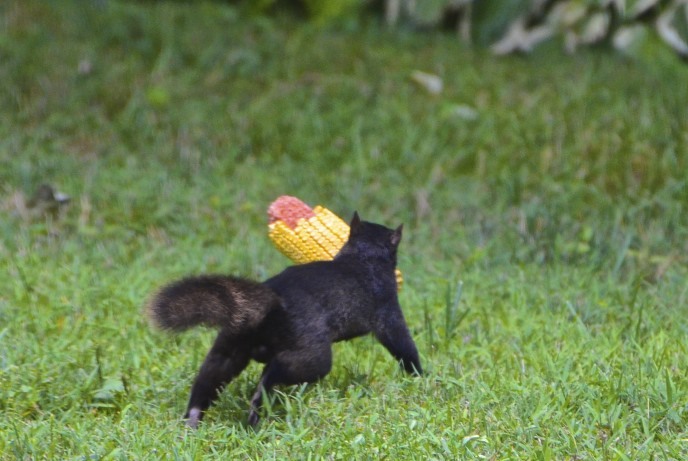 The photo of Darth running off with the corncob is adorable. You know he's gonna try this... get your camera ready. 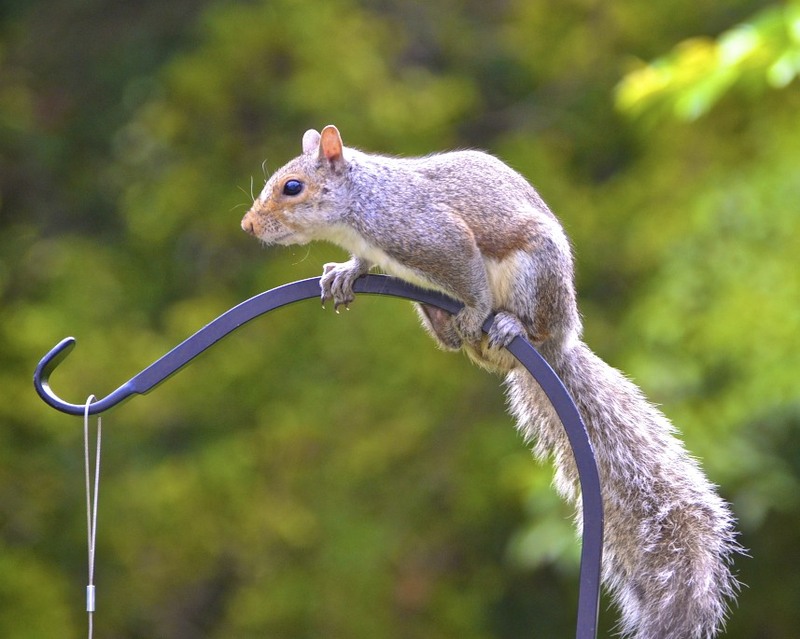 He's the Evil Knievel of the squirrel community. Great narrative ... that young cardinal looks a bit befuddled. This is hysterical! I love the way you anthropomorphize your backyard critters. 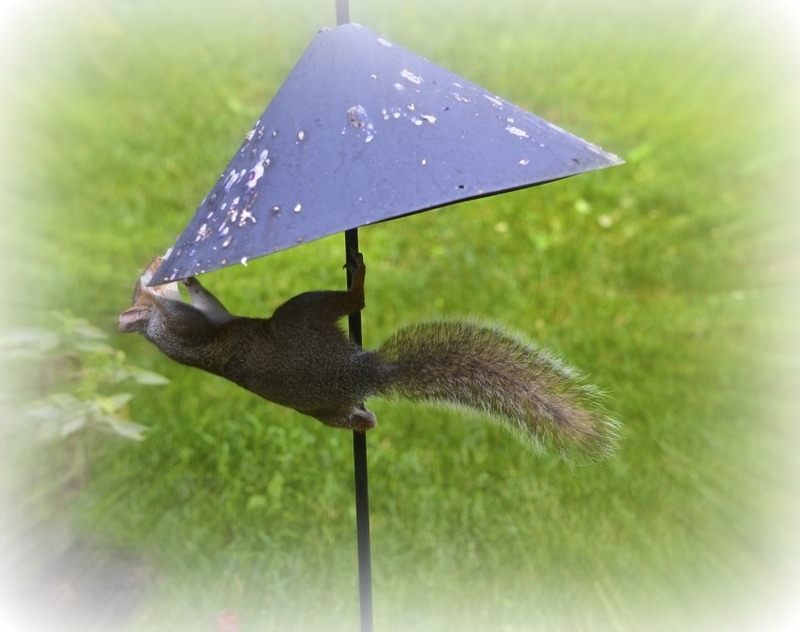 Those pesky squirrels eat all my bird food too. Do you have grey, black and red squirrels? we only have the grey ratty sort. 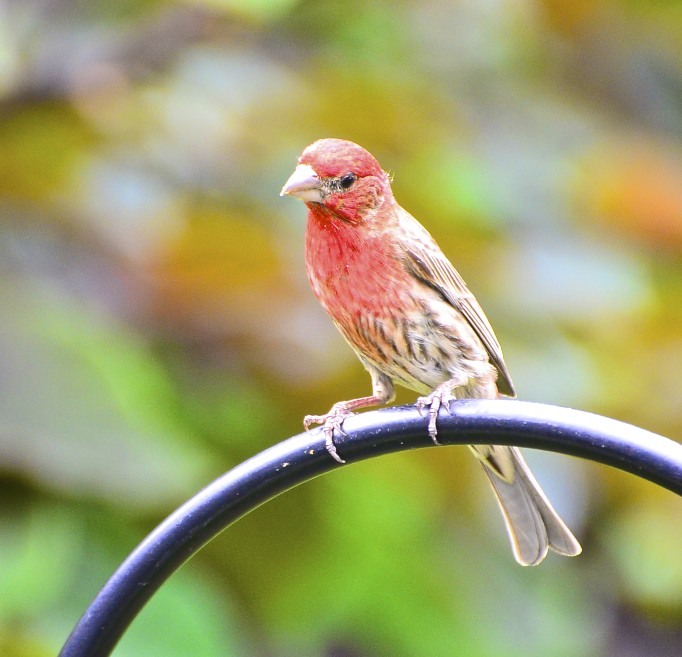 You have some amazingly beautiful birds in your yard! As always, I love your commentary. Great story, and well illustrated! 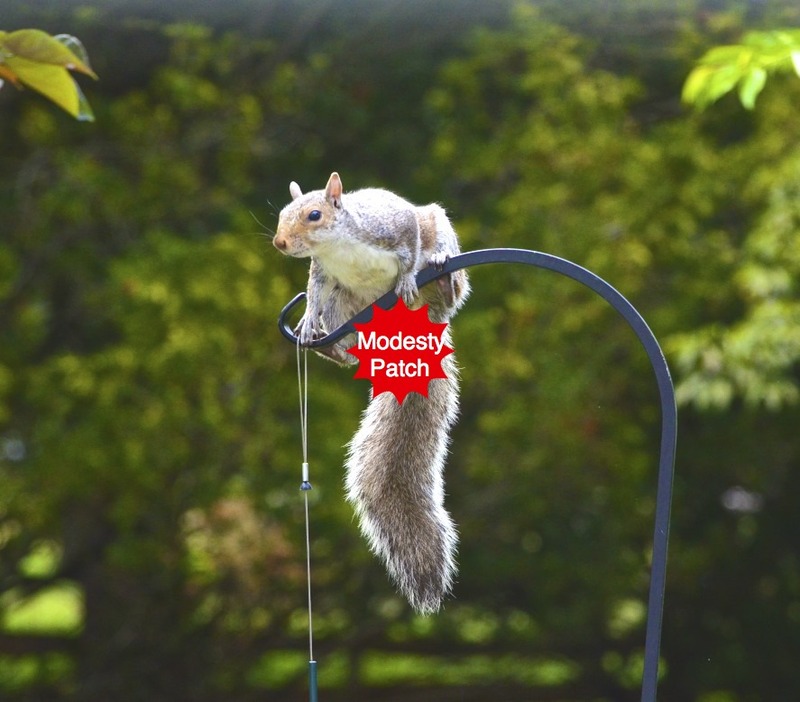 I got a chuckle out of the "Modesty Patch!" very nice and some are really cute! Wow! lol. You should write a book. Thoroughly entertaining. And wonderful captures! I especially love blue jay bobbie and darth vader squirrel. Thanks for joining Kristi and I for the Crazy Days of Summer! he he he ~ yeah! wow, i would LOVE to be at your house and see all of that! These are some fantastic captures! I love the birds particularly! I hope he gets the hint from the house lady and stops stealing the bird food! ;D Oh my goodness,love the modesty patch!!!! what a great cast of characters!...love it! How funny ... and wonderful ... and entertaining. I am SOO going back to push your Follower button so I don't miss a minute of the adventures in your yard. This looks like our back yard even down to the squirrel "preventers".